The next edition of Rock in Rio, which will take place in September in Rio de Janeiro, has some new features. 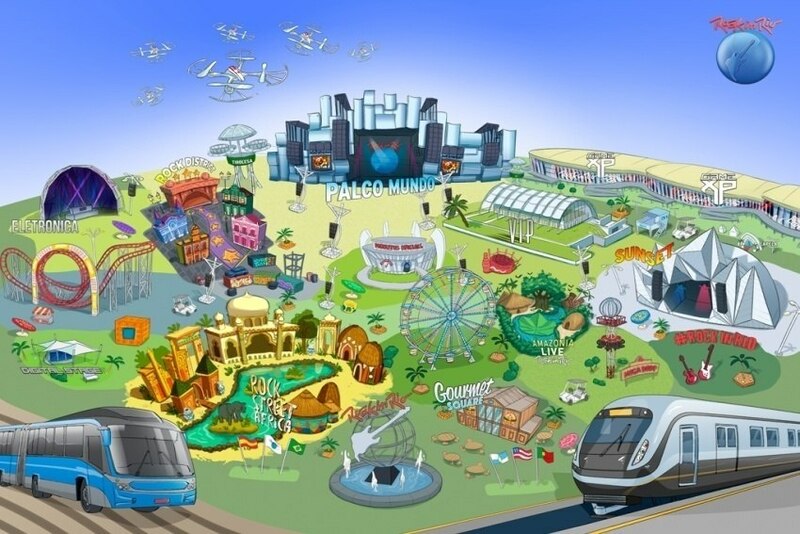 The next edition of Rock in Rio, which will take place in September in Rio de Janeiro, has some new features: a new stage for digital phenomena, a space dedicated to gaming, a gastronomic plaza inspired by the Ribeira Market and a theme neighbourhood Los Angeles inspired. "Rock in Rio is recognised for being a privileged place of experimentation. The audience does not go to the event exclusively for the artists who perform on stage, as show the tickets sold even before we advertise the performers. What brings these people to the festival is the festive atmosphere and the quality of the countless experiences that exist within the same space," says Roberto Medina, president of Rock in Rio, which has been in existence for 32 years. The City of Rock continues to innovate, is 'more modern, spacious and has a 'tech-friendly' environment. And all this is part of a global strategy "that aims to bring new formats and innovative content to the event," the organisation said in a statement. At the Digital Stage, there will be digital influencers: musicians, bloggers, dance groups, comedians, online entertainment phenomena. "Digital influencers are the new idols of the youngest target and the main ones responsible for a profound transformation in the way content is consumed," says Roberta Medina, adding: "In this new stage we will give fans the chance to have direct contact with their influencers, while bringing online entertainment content to the offline world in a more intimate space inside the venue." In addition, Rock in Rio features Game XP, a partnership with CCXP -ComicCon Experience, which aims to bring the 'gaming' experience to the festival. "Bringing new content into the City of Rock, such as 'gaming' or digital phenomena, broadens the 'empowerment' of the public about the content we offer and aligns with our strategy of building a Rock City ever more similar with a large theme park of music and entertainment," explains Roberta Medina. Another of the novelties is the Gourmet Square, an area inspired by the Ribeira Market in Lisbon. It is a plaza dedicated to gastronomy, with 14 shops and restaurants, and that will have the capacity to seat 630 people. The new theme neighbourhood is inspired by Los Angeles. The Rock District is intended to be a tribute to music and will feature, among other things, a walk of fame - Rock in Rio Boulevard - and a wall of celebrities - Rock in Rio Wall of Fame. And because this is a music festival, among performers are names such as Lady Gaga, Guns n' Roses, Justin Timberlake, Aerosmith, The Who, Bon Jovi, Maroon 5 and Red Hot Chili Peppers, among many others.